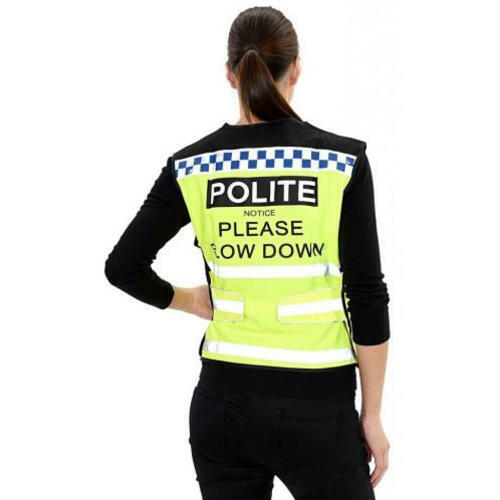 The Equisafety Please Slow Down Polite Waistcoat is a stylish and comfortable waistcoat cut to ergonomically fit the body. Very flattering fit and fully adjustable at the back. Features breathable mesh black panels and two large zipped pockets with a blue and silver reflective strip across the back. The Equisafety Please Slow Down Polite Waistcoat has been proven time and time again that it really does slow the traffic down. Passes EN1150. Fully washable at 30 degree C.
These sizes are all fully adjustable. For example, the Medium can also become a small or a large if required.